If you have/work with children or own an iPod/iPad, you know what Angry Birds is. I have not met anyone who did not like the game Angry Birds. 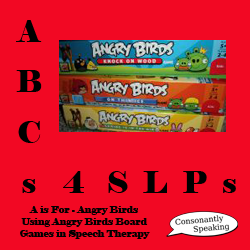 Many SLPs and therapists have used Angry Birds images on worksheets and board games that they have created. However, Rovio recently contacted Teachers Pay Teachers to state that there were some copyright violations and requested that all Angry Birds worksheets be taken down from Teachers Pay Teachers. You must always be careful when creating your own worksheets to be aware of copyright laws. Anyhow, Angry Birds is not only an application - they now have three board games and a card game available for purchase! You can buy them at Target/Meijer/Walmart or online at Amazon.com. 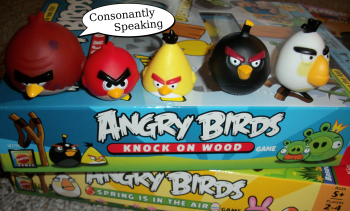 Continue reading to see how I use Angry Birds board games in speech-language therapy! 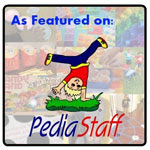 There are many different ways that you can use the Angry Birds board games in therapy. Adjectives/Actions - Have students describe the various Angry Birds' and Pigs' features/actions. You can see the different pigs' attributes here (mustache, helmet, bunny ears, etc.) but the only difference in difficulty is that the ones with helmets on are harder to explode. The cards show a sequence of birds in order that the person playing is supposed to use to knock down blocks. Have your child try to recall the order of the birds. Usually there are only 2-3 birds used. In addition, you can tell students how to set up the blocks and see if they can follow the directions and match it to the picture. Another way to have students work on following directions is to read aloud the order of the birds to launch at the wooden blocks and see if the students can recall the order. 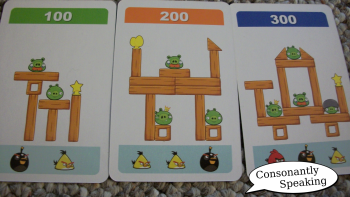 The cards above show how the blocks and pigs are to be arranged. Some pigs are on top of the blocks, some are under, some are next to, and some are in-between two blocks of wood. You do not need to use the cards to set up the wood/pigs. Set it up how you would like or tell students to set it up using prepositions to describe the set-up. Place cards between the wooden blocks like in my previous post from a few months ago. Have students say the word on the cards as they are knocked down. Also, you can give students 5+ cards at a time and then let them launch a bird, then 5+ more cards, then another bird (and so on) as a reinforcer. To work on social skills, have the student think about why the birds and pigs are angry and what they could do to solve their problem. Another way to work on social skills is through conversation between the birds and the pigs. If a student is working on complimenting others or taking turns, this is a great way to practice positive game play. For story telling, have students tell a story about why the birds and pigs are angry and what happened next. Have the students think about each groups' perspective on the situation. 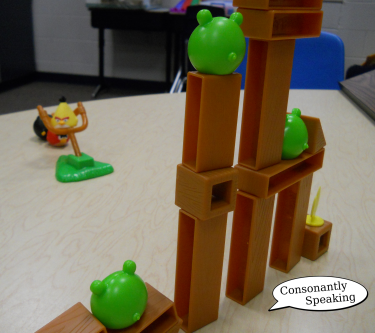 Have students write or state aloud a sentence about the Angry Birds/Pigs. Speech Room News has a great worksheet for this. Speech Room News used a printout of an Angry Birds cube for conversation starters. 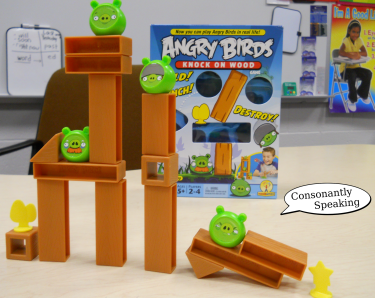 Jill Kuzma created three articulation board games using Angry Birds. The Home Teacher created a great behavioral/anger management resource using Angry Birds. 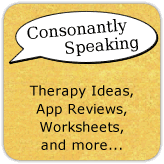 Do you have any other ways that you use the Angry Birds board games or incorporate Angry Birds into your speech therapy lessons?